The Legend & The Legacy was Pete Kleinow’s third solo album, released in 1994, that contains covers. 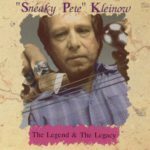 Peter E. “Sneaky Pete” Kleinow (August 20, 1934 – January 6, 2007) was an American country-rock musician, songwriter, and a motion picture special effects artist. He is best known as a member of the band the Flying Burrito Brothers and as a session musician for such artists as Joan Baez, Jackson Browne, The Byrds, Joe Cocker, Rita Coolidge, Eagles, The Everly Brothers, George Harrison, The Steve Miller Band, Joni Mitchell, The Rolling Stones, Ringo Starr, Stevie Wonder, Spencer Davis, Linda Ronstadt and many others. Recording Studios: The Phoenix Group Studios,Hollywood. Suite 16 Studios,Van Nuys.Present Time Recorders,North Hollywood.TTG Recording,Hollywood.Conway Recording Studios,Hollywood.